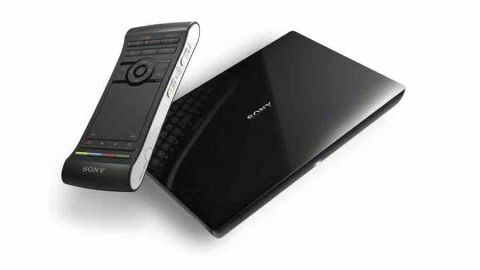 Can the Sony's first Google TV box app the ante? Owners of smart TVs are used to apps like YouTube and the BBC iPlayer, and even the ability to surf the web, but Sony's refreshed attempt at Google TV seeks to streamline the whole process by combining a Chrome browser with a selection of Google Play apps - and all controlled by a double-sided trackpad remote with a keyboard on its reverse. Can this Android-based, slim-line box that depends on Google Play for its apps seriously challenge the likes of the Apple TV, Xbox 360, YouView or smart TVs? A quick inspection of the NSZ-GS7's apps reveals one huge oversight; there's no BBC iPlayer, though it is in the pipeline. What about catch-up apps for ITV Player, Channel 4 and Five? For a UK-centric service these apps ought to be integral, or at least idiot-proof access to them via Chrome. The main toolbar, accessed by pressing the 'home' button on the remote, includes (from left to right), the current time, notifications and links to recent apps, a grid icon that leads to a full page of native and downloaded apps, a shortcut to show live TV if a set-top box is connected, and then dedicated shortcuts to YouTube, Google Play, the all-important Chrome, the less crucial Sony Entertainment Network (Video Unlimited, Music Unlimited, DailyMotion, GolfLink, Livestrong.com and NPR radio), a search option, and a help button. In the apps folder we found Netflix (the much-needed result of a recent firmware update) and Twitter, though only 16 apps can be shown at one time (in A-Z fashion) while a third of the screen lies empty. That's a real shame because most of the apps here are either repetitive from elsewhere in the GUI or of limited appeal - such as a link to the Media Player (USB stick access), Chrome, Google Play, YouTube, Search, Product Registration, Help Guide and Settings. It's a shame since scrolling down a page is a stodgy experience. Other apps of note here include Track ID (Sony's own music identifier) and Photos (encompassing photos stored on a USB stick, Flickr or on an Android phone. Being a Google TV box, the NSZ-GS7 is at least in part subject to the quality and range of the apps it can download from Google Play. We visited Google Play to download extra apps, but met with great disappointment; Netflix, Red Karaoke for Google, IMDb, Flixster, Evernote, Weather Channel, iStoryBook, OpenOffice Document Reader and Fox News are probably the highlights - few of them video-orientated - with myriad more apps that you really won't want to bother with. Presumably the aim is to offer every app used by Android phones on Google TV, though surely 99% of them should be providing video, movies and TV. We also worry slightly about the motley collection of apps hiding behind the Sony Entertainment Network link. It's good to see both Video and Music Unlimited services, but we're not sure why Sony has chosen to include some of the frankly uninspiring apps - such as Golflink - from its Smart TV platform. We're not sure of the point of this extra layer. The search function is poor, capable of discovering content in its Media Player - that means a USB stick, if attached - or through a basic web search of Chrome. It doesn't, for instance, find any relevant video; a search for Top Gear merely performs a search of the web that doesn't include a link to the content on the BBC iPlayer, or BBC America episodes available to all in YouTube. Most smart TVs, although limited in content, have better search functions than this; we'd expected more from Google on this front. For all of Google TV's faults as a platform, Sony has done a decent enough job with the WiFi-endowed NSZ-GS7, though it does run on the ageing Android 3.2 Honeycomb OS. Equipped with HDMI in and out for switching purposes), it's possessed of a digital optical audio output, two USB slots and a Bluetooth link for communicating with Android phones. As well as wired LAN, there's also an IR blaster cable. Much like your average smartphone, the NSZ-GS7 has about 8GB of storage on-board. Those not able to master the frankly odd remote control, which puts a touchpad in amongst a plethora of baffling controls (though Android phone owners will be au fait with some of them) and a QWERTY keyboard on the reverse, can opt for the Sony Media Remote app available for iOS and Android. It's more sensitive than the 'proper' remote and does make operating both the browser and the YouTube app easier. It's possible to play video, music and photos from a docked USB stick. In our test we managed to get AVI, AVC HD, MKV, MOV, MPEG, WMV and WMV HD video files to play while music (MP3, AAC, FLAC & WAV) and photo (JPEG, BMP, GIF & PNG) compatibility also impressed. The thumbnail representation of video content is excellent. ESFile Explorer File Manager, a free app from Google Play, can delve into cloud storage servers from the likes of Dropbox, Google Drive and SkyDrive as well as NAS drives and your phone or PC. aVia Media Player does a similar job for free, too, though it didn't work with our Mac running TwonkyMedia UPnP. There's also a tempting Plex for Google TV app, which costs 62p. It's a neat intro to a new way of thinking; Sony builds the basic hardware, and app developers offers extra features and functionality. Sounds messy … and potentially confusing for many.